The men have decided to join the DC Lil Bombshells party! Series 3 adds 11 unique figures, including Batman, Superman, and The Joker. Don't worry: DC's fantastic female heroes and villains are still around and are more explosive than ever! Harley Quinn is back-this time, with her two hyenas- and is joined by Powergirl, Raven, Stargirl, and more. Each 2 3/4-inch tall figure comes packaged inside Cryptozoic's signature collectible, blind-reveal tin. 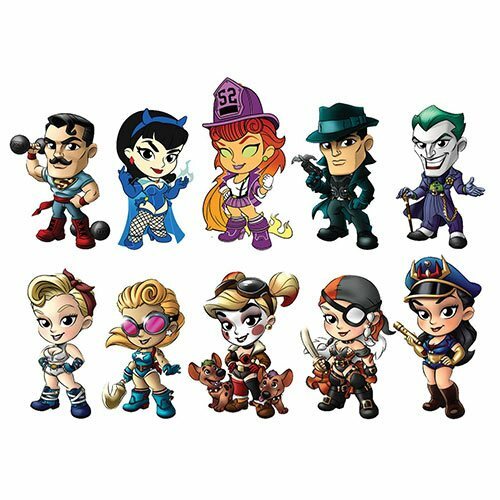 The DC Lil Bombshells Series 3 Mini Vinyl Figure Random 4-Pack contains 4 individually randomly picked, blind-packaged mini vinyl figures.